Always wanted to own a MotoGP bike? Well now you can, sort off. Yamaha has introduced its MotoGP livery for the YZF-R15 v3.0. Called the YZF-R15 MotoGP Edition, it is essentially the Yamaha Racing Blue colour variant with Movistar livery and colour-coded rim stickers. Priced at Rs 1.3 lakh (ex-showroom Delhi), the special-edition motorcycle is Rs 3,000 dearer than the standard model. Other than cosmetic updates, the motorcycle remains unchanged. Powering it is still the same 155cc liquid-cooled SOHC motor, which churns out 19.3PS at 10,000rpm and 15Nm at 8500rpm, mated to a 6-speed transmission with assist and slipper clutch. Brakes are also the same 282mm front and 220mm rear discs, without ABS. Telescopic front forks and a rear monoshock handle suspension duties. It goes up against the Bajaj Pulsar RS200 and KTM RC 200. 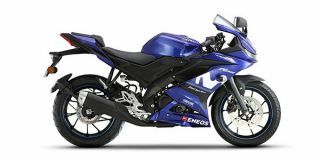 Yamaha YZF R15 V3 Moto GP Edition prices start at Rs. 1.30 lakh (Ex-Showroom). Yamaha YZF R15 V3 Moto GP Edition is available in 1 variants and 1 colours. Share your experiences with YZF R15 V3 Moto GP? Q. Overall which one is better Duke 200 or R15 V3? Q. Which is best, MT-15 or R15 V3? Q. Which one is best R15S or R15 V3 in terms of pickup and acceleration? Q. Which is best R15 V3 or Thunderbird 350X? Q. WHETHER DUKE 250 IS HAVING SLEEPER CLUTCH AND ABS IN BOTH WEELS. CAN THE ABS BE MADE OFF ON THE OFF ROAD THROUGH A SWITCH? maintenance ka jayada khyal rakhna padta hai. Confused about Yamaha YZF R15 V3 Moto GP Edition?